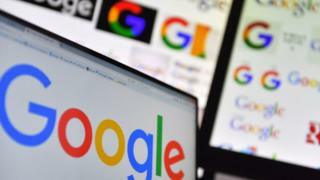 Alphabet, the parent company of Google, has reported a 22% rise in fourth quarter sales, fuelled by an increase in online advertising. Revenues rose to $39.2bn (£30bn) for the final three months of the year. However, shares in Alphabet fell by more than 3% in after-hours trading as its capital expenditure jumped to $7bn. The company said it had invested in data centres and offices, hired more engineers and spent money acquiring content for services such as YouTube. George Salmon, equity analyst at Hargreaves Lansdown, said: "While the core business is still growing impressively, the significant spending shows growth isn't quite as capital light as had been hoped." Over the year, capital expenditure rose to $25.1bn from $13.1bn in 2017. Operating costs, which include the money Google pays to acquire traffic, also increased. On a call with financial analysts, Alphabet's chief financial officer Ruth Porat said that capital expenditure would "moderate quite significantly" this year. But she added that the firm remained committed to investing in long-term opportunities. "We are very focused on investing to support long-term revenue and earnings growth," she said. Although online advertising remains the core of Alphabet's business, the firm has expanded into new areas, including health care and self-driving cars. Revenue in that "other bets" division increased more than 17% to $154m in the quarter. However, operating losses grew faster to almost double to $1.3bn. The tech giant has faced increased public pressure, amid calls in the US for stronger protections of user data and better monitoring of so-called fake news. Sundar Pichai, chief executive of Google, told analysts to expect the firm to "do a lot more" to give people more control of their data in 2019. For now, however, there is little sign that those concerns are hurting the firm's business. Alphabet's profit in the quarter increased to $8.9bn, reversing from a loss in 2017 due to a one-time tax charge. For the full year, pre-tax profits reached $30.7bn, up from $12.66bn in 2017.